1. Surgery Branch, Center for Cancer Research, National Cancer Institute, NIH, Bethesda, MD, USA. 2. Biostatistics and Data Management Section, Office of the Clinical Director, Center for Cancer Research, National Cancer Institute, NIH, Bethesda, MD, USA. 3. Urologic Oncology Branch, Center for Cancer Research, National Cancer Institute, NIH, Bethesda, MD, USA. 4. Department of Surgery, Division of Surgical Oncology, Walter Reed National Military Medical Center, Bethesda, MD, USA. 5. Bon Secours Cancer Institute, Richmond, VA, USA. Background: Metastatic renal cell carcinoma (RCC) to the liver portrays a poor prognosis and liver directed therapy remains controversial. We aimed to determine potential selection criteria for patients who might benefit from this strategy. Materials and Methods: We evaluated 247 consecutive patients with RCC metastatic to the liver from a prospectively maintained database. Results: Eighteen patients received liver directed therapy (18/247, 7%). Ten patients underwent liver resection (10/247, 4%) and eight patients underwent radiofrequency ablation (RFA, 8/247, 3%). All were rendered free of disease in the liver. Five had synchronous liver disease and underwent synchronous resections with their primary. Mortality was 0%. Fourteen had single (surgery 7, RFA 7) and four (surgery 3, RFA 1) had multiple liver lesions, respectively. Median size of lesions was 5cm (0.5 - 10cm) and 2.5cm (1 - 6cm) in the surgery and RFA groups, respectively. Median DFI was 10 months, and no difference was observed in those with a longer vs. shorter than median DFI (p = 0.95); liver specific progression free survival for the surgery and RFA groups were 4 and 6 months, respectively (p= 0.93). 1, 3 and 5-year actuarial survivals for the whole group were 89%, 40%, 27%. Median survival for the surgery group was 24 (3 to 254+) months, and for the RFA group 15.6 (7-56+) months (p = 0.56). Metachronous liver disease was associated with prolonged survival (p = 0.02). Conclusions: Liver directed therapy for RCC is safe. For highly selected patients with metachronous liver RCC metastases, liver directed therapy should be considered in a multidisciplinary manner. Keywords: liver resection, metastatic renal cell carcinoma, liver metastases, radiofrequency ablation. The incidence of renal cell carcinoma (RCC) is rising with approximately 58,240 new cases and 13,040 deaths estimated for 2010 . 30% of patients with RCC will present with metastases and upwards of 50% of patients will develop metastatic disease with 20 to 40% of patients having disease in the liver . Metastatic RCC portends a poor prognosis and is relatively resistant to systemic therapy. 5-year survival rates are poor with only 20% of patients surviving with metastatic disease . Median survival in these patients has been measured to range from 10 to 20 months. Patients with hepatic disease have been found to live a median of 7.4 months . As with other solid cancers metastatic to the liver, once RCC metastasizes to the liver it is often the rate-limiting step for survival. Currently, there is a paucity of data to support liver directed therapy for metastatic RCC. Although, survival could be significantly improved after resection of lung metastases, treatment of liver metastases with either surgery or radiofrequency ablation (RFA) remains uncommon and controversial . To date, there are only 20 published studies involving liver resection for RCC with only 7 series reporting on more than ten patients (Table 1) . Therefore, we investigated our experience with liver directed therapy for RCC in order to determine potential selection criteria for patients who might benefit from this strategy. This is a retrospective review of a prospectively maintained database of patients with RCC metastatic to the liver (n = 247) at the National Cancer Institute, NIH (Bethesda, USA) from 1980 to 2010. Eighteen patients underwent liver directed therapy (18/247). Ten (10/247) patients underwent liver resection and eight (8/247) patients underwent RFA. All patients signed institutional review board approved consent for participation in clinical studies. Resectable extrahepatic metastases were not considered a contraindication. Literature review of liver resection for metastatic renal cell carcinoma. Overall survival (OS) was calculated from date of liver directed therapy to last encounter, or death. For patients resected to no evidence of disease (NED), disease-free survival (DFS) was calculated from hepatic resection to first recurrence, or to last follow-up without recurrence. Liver recurrence-free survival (RFS) was calculated from date of liver directed therapy until death, last follow-up or date of first liver progression. For patients with residual disease after liver directed therapy, progression-free survival (PFS) was calculated from date of liver directed therapy to progression at any site or last follow-up without progression. The disease free interval (DFI) was calculated from time of initial surgery when resected to NED until first recurrence at any site. The probabilities of survival, liver RFS, DFS, PFS and DFI were calculated by the Kaplan-Meier method; the statistical significance of differences between pairs of Kaplan-Meier curves was determined by the log-rank test for cases in which the distinguishing characteristics of the curve were known at the date of resection. Clinicopathologic features were evaluated for their association with outcome by univariate methods described above. All p-values are two tailed and are presented without adjustment for multiple comparisons. Inclusion criteria included patients who underwent liver resection or RFA for pathologically confirmed RCC metastatic to the liver. Patients were excluded if liver therapy was not delivered at the NCI, final pathology was benign, liver resection occurred for extension of the primary into the liver, and patients who received systemic therapy only. Median age of patients who underwent liver resection was 47 (range 32 - 58), RFA 56 (range 44 - 78) and overall 51 (range, 32 - 78). Fourteen patients were male and 4 female. At the time of primary diagnosis 11 patients had stage IV disease (5/11 liver, 5/11 lung, 2/11 pleural, 1/11 brain, 1/11 bone ), 6 patients stage II and 1 patient stage I. Patients and tumor specific characteristics are depicted in Table 2. Patient demographics and tumor specifics. All 18 patients had histology confirmed renal cell carcinoma, sixteen clear cell tumors, one papillary and one sarcomatoid variant. Two patients had familial RCC, one Von Hippel-Lindau syndrome (VHL) and one hereditary leiomyomatosis and renal cell cancer (HLRCC). Thirteen patients underwent the primary nephrectomy at the referring institutions. At time of diagnosis eleven patients had synchronous extra renal disease, and six patients had extra renal disease resected at the time of initial operation. Resections of extra renal disease included, five livers, two lungs, two adrenals and one retroperitoneal resection. Seven had no evidence of disease following their primary surgery. Four patients had received neo-adjuvant immunotherapy. Three received adjuvant immunotherapy (interferon (IFN) and high dose Interleukin-2), and one received adjuvant adoptive cell transfer with tumor infiltrating lymphocytes. Liver metastases were metachronous in thirteen patients and synchronous in five patients. The median time to development of liver metastases from the primary operation was 19.5 months (range, 0 to 142). Fourteen patients had single (surgery 7, RFA 7) and four (surgery 3, RFA 1) had multiple liver lesions, respectively. Median size of lesions was 5cm (0.5 - 10cm) and 2.5cm (1 - 6cm) in the surgery and RFA groups respectively. Fifteen lesions were within the right liver (surgery 9, RFA 6), two in the left (surgery 1, RFA 1) and one unknown (RFA). Five patients underwent right lobectomy, four wedge resections, one extended right hepatectomy and eight RFA. In those undergoing surgical resection all were rendered free of disease in the liver and 7/10 patients had no evidence of disease (NED) systemically. For those receiving RFA, two patients had an open RFA accompanying resection of extra-hepatic disease and the remaining six patients had percutaneous RFA leaving extra-hepatic disease following liver directed therapy. Details are depicted in Table 3. All patients resected were rendered free of disease in the liver. Morbidity was acceptable and included blood transfusion (2/10) and wound infections (1/10). Sixty day peri-operative mortality was 0%. Eleven (11/18) remained disease free in the liver (resection 7/10, RFA 4/8) at a median follow-up of 23.5 months. Recurrent disease developed in fourteen patients (14/18) (9/10 resection, 5/8 RFA). Eleven patients recurred in the lung (resection 7/10, RFA 4/8). 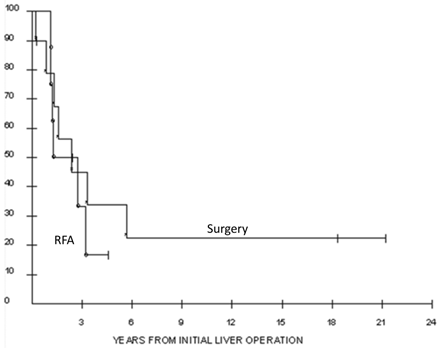 Liver recurrences were seen in seven patients (7/18) (surgery 3/10, RFA 4/8). Other recurrences included 2/18 pleural, 1/18 renal bed, 2/18 pleural, 1/18 mediastinal, 2/18 bone, 1/18 retroperitoneal and 2/18 brain. Median time to any recurrence was 4 (1 - 18) and 6 (2 - 76) months for the surgery and RFA groups, respectively. In those resected to NED the median disease free survival was 7.2 months and 1.2 months for the surgery and RFA patients respectively. Progression free survival from liver therapy was 1.2 months and 6 months (p=0.01), and disease free survival was 7 months and 1.2 months (p=0.56) for the surgery and RFA groups, respectively. Median DFI was 10 months and no difference was observed in those with a longer DFI (p = 0.95); liver specific progression free survival for the surgery and RFA groups were 4 and 6 months, respectively (p= 0.93). For the whole cohort, 1, 3 and 5-year actuarial survivals were 89%, 40%, 27%. Actuarial survivals for the surgery and RFA groups were not significantly different, with 1, 3 and 5 year probabilities of survival of 79%, 45%, 34% and 100%, 33, and not reached, respectively (p= 0.56, Figure 1). Median overall survival for the surgery cohort was 24 (3 to 254+) months, and for the RFA cohort 15.6 (7-56+) months. Synchronous disease was found to be negatively associated with survival in surgery patients. 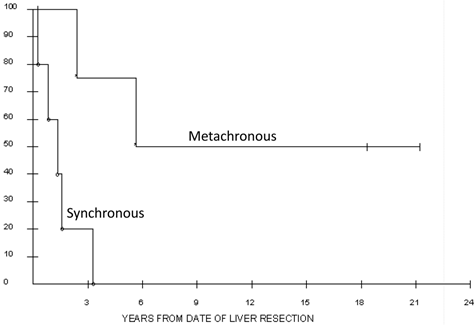 Those undergoing synchronous resections lived a median of 1.1 years following liver resection compared to 5.7 years in those resected in the metachronous setting (p = 0.02; Figure 2). Overall survival of the 18 patients who underwent liver resection (n = 10) or radiofrequency ablation (n = 8) for metastatic renal cell carcinoma. The 5-year actuarial survival was 27% for all patients. Overall survival of the 10 patients who underwent synchronous versus metachronous liver resection for metastatic renal cell carcinoma. Median survival for the synchronous group was 1.1 years versus 5.7 years in the metachronous group. We did not see statistical significance with respect to survival according to the number of liver metastases, disease free interval (DFI), presence of extra hepatic disease, resection of extra hepatic disease or rendering a patient completely NED. Approximately, 80% of patients with renal cell carcinoma will develop metastases; of these, 20-40% will develop liver disease. Historically, liver metastases have been an ominous prognostic feature. In fact, those with hepatic disease have been found to live a median of 7.4 months . One may therefore state that tumor burden in the liver is often a rate limiting step for survival. The poor outcome of patients with liver metastases may partly be explained by the fact that, in most cases, liver metastases are multiple and occur in association with metastases to other sites which is in accordance with the hematogenous pattern of spread of RCC . In fact, liver metastases of RCC are solitary in only 2 to 4% of cases . The question, which therefore remains, is whether liver directed therapy with or without extra hepatic disease is associated with increased survival? Response to systemic therapy remains poor. Objective response rates are only seen in 15% of patients with high dose IL-2 and chemotherapy responses remain inferior. In the modern day of hepatobiliary surgery mortality rates are low (0 - 2%) and morbidity rates are reasonable (33%) . Thirty percent mortality associated with liver resection is no longer the case . That being said, liver resection for metastatic RCC remains controversial and there is even less data supporting the use of RFA. Historically, the majority of literature documenting resection of RCC liver metastases came from case reports or small numbers of RCC patients included in liver resection manuscripts for noncolorectal, nonneuroendocrine metastases   . More recently there have been four particular studies with 15 or more patients that produced thought provoking results. Median survival rates in these recent studies for patients undergoing resection ranged from 24 to 142 months and when compared to historical controls resection remained superior (Table 3). However, one should remain cognizant that all of these data sets are based on relatively small numbers of patients, biased and without relevant control groups in the majority of studies. A more recent study was a comparative study in which Staehler et al reviewed patients undergoing liver resection for RCC and used a population of patients who refused liver resection as their control. To date, this is the only comparative study in the literature. They published a median survival of 142 months for patients undergoing liver resection for RCC with a median 5-year survival of 62.6% . These results were superior to the control. Moreover, in contrast to previous studies these long term results are not inferior to survival rates achieved with liver resection for colorectal metastases and are comparable to survival results of resection of pulmonary metastases for RCC, which are currently both generally accepted indications for an aggressive surgical approach  . The other finding in this study was that synchronous liver metastases at initial diagnosis was associated with a significantly lower survival than metachronous metastases. Median survival was 155 months with metachronous metastases compared to 29 months in the synchronous group . Note that although the long term median survival could be influenced by the high proportion of patients (79%) receiving systemic therapy late in the course of disease, there was an equal proportion of patients treated systemically in the synchronous group . Although, one cannot conclude that the survival difference between the two groups may be an expression of liver resection however it certainly indicates that further studies should be performed in a scientific manner. Although proper selection criteria have yet to be established, the above studies have documented positive prognostic factors. Studies indicate that improved survival was seen when the disease free interval (DFI) to liver metastases was greater than 24 months, metastases were less than 5cm and a R0 resection was performed  . However, Thelen et al found that even in patients with a short DFI long-term survival can be achieved by hepatectomy . Unfortunately recurrence rates are high in those with metastatic RCC. Most studies (including our own) found that the disease recurs in the majority of patients following hepatectomy. In fact, many patients (50%) will recur within the first year . Although there is a paucity of data, repeat resection has been advocated by a number of groups. In particular, Aloia et al. found that patients who had recurrences in the liver following resection and underwent repeat hepatectomy experienced longer survival when compared to patients who were not re-resected . Further, Alves et al stated that due to the constant tumor recurrence observed after liver resection an aggressive policy to treat hepatic metastases was associated with prolonged survival as demonstrated by the improved outcome of patients who were submitted to repeat hepatectomy . One may postulate that repeat resection may have the ability to prolong remission when the tumor recurrence occurs in the liver. A finding that a subset of patients with resectable recurrences have longer survival rates when compared to patients with unresectable recurrences supports the argument that surgery with favorable biology may be responsible for improved outcomes . Therefore, we advocate close clinical follow up with computed tomography imaging in all resected or ablated patients. In at least one multivariate model, debulking of greater than 90% of RCC metastases was associated with a significantly increased survival . Therefore, one may presume that liver directed therapy for RCC may have increased efficacy if used in a multidisciplinary fashion. Kim et al concluded that surgical resection when performed in patients found to have a partial response to interleukin-2 for metastatic RCC increased survival . We believe that in this era of new systemic options such as tyrosine kinase inhibitors and other targeted based therapies, a more aggressive surgical approach may be appropriate for patients with advanced RCC . When analyzing all recent studies published (Table 1) 5 year survival rates are superior to historical controls with the most recent and largest two studies showing 5 year survival rates of 43 - 62%  . Moreover, these results compare favorably to those of hepatic resection for hepatic metastases . Our series of patients adds to this limited data set and will hopefully lead to hypothesis generation in order to formulate further trials. Limitations to our study are clear. It is a retrospective analysis with a small sample size and there is a selection bias for all patients who were treated at the National Cancer Institute, NIH. We believe concrete survival conclusions cannot be drawn from this small sample size however; the results are intriguing and may help further other studies. Moreover, we argue that in the absence of alternative treatments of demonstrated efficacy and the poor natural prognosis of liver metastases from RCC an aggressive policy for achieving tumor eradication may offer a chance for long-term survival. Although RCC metastatic to the liver portends a poor prognosis, our data and others suggest that, for some patients, liver resection may potentially result in improved survival. In our series, when compared to RFA, liver resection resulted in a trend for a longer median survival. We propose that liver resection is safe and should be considered only in highly selected patients with metachronous disease and in a multidisciplinary manner. This research was supported [in part] by the Intramural Research Program of the NIH, National Cancer Institute. Corresponding author: Russell C. Langan, MD. Surgery Branch, National Cancer Institute / NIH, Building 10-Hatfield CRC, Room 3-3940, 10 Center Drive, Bethesda, MD 20892, Russell.Langancom, Fax: 301-451-6905.